☆☆☆☆ “A spin-off of Jemaine Clement and Taika Waitii’s hilarious 2014 mockumentary about vampire housemates, it transplants the idea from Wellington, New Zealand, to Staten Island, New York, where Nadja (Natasia Demetriou), her husband Laszlo (Matt Berry) and former Ottoman Empire warrior Nandor (Kayvan Novak) have shared a house for several unpleasant centuries, having utterly failed through indifference in their mission to conquer and enslave the new world for all of vampkind … Is it as consistently hilarious as the movie? No, but it’s unfair to compare an ongoing series and a 90-minute film. And the laughs, when they come, are usually explosive.” — Rolling Stone. ☆☆☆☆ “This show’s laughs are closer to chuckles than guffaws — it’s well-observed but its ambitions feel more minor than much else in this era of the relentless big swing. At times, it feels as though the show’s main goal is to present witty wordplay voiced by a few memorable characters. But that can certainly be enough, not least when the show’s mockumentary format feels, for the first time in a while, like something new.” — Variety. ☆☆☆☆ “There is a point early on in FX’s newest comedy What We Do in the Shadows, based on the acclaimed feature film about, well, funny vampires who take part in a documentary, where you wonder through the best of the hilarity if a 10-part series can keep up this level of creativity. After all, you really have to be all-in on the concept, since being ridiculous and silly are essential elements, but one after another, little bits of unexpected ideas drop into the mix and alleviate all worry. That and, well, all four of the episodes made available for review are funny and inventive.” — The Hollywood Reporter. 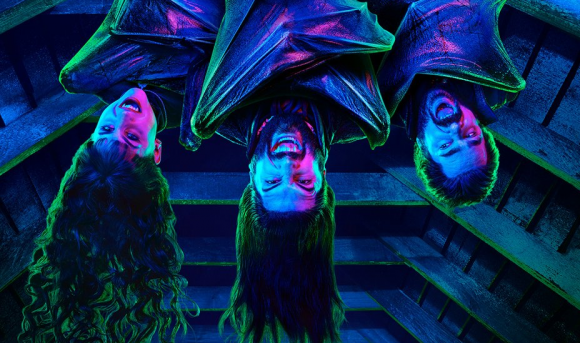 ☆☆☆☆ “What We Do In The Shadows honours and recreates Waititi and Clement’s original mockumentary magic, lifted and adapted as a singular spinoff. New house, new characters, same sense of humorous vampiric skewering (Twilight references, gory feeding times, Guillermo’s excitable fandom obsession, lavish costumes/effects/production design). Given time to breathe, and evolve, there’s every bit of hope this FX series will attain the same praise and worship still alive for Waititi and Clement’s existing film.” — Slash Film. ☆☆☆☆ “Jemaine Clement’s TV show is alive with possibilities, and keen to find humour in every corner of its idiosyncratic vampire world. In the first half of its debut season, the creator (along with producers Taika Waititi and Paul Simms) moves rapidly through his new characters, setting, and individual plots, building anticipation as efficiently as he elicits laughs. There’s still room to grow, but Clement’s adaptation gets a lot of the finer touches just right, straight off the bat.” — IndieWire.